2-1-1 Northeast Michigan is your free, single connection to the hundreds of health and human services available in your community. You get one-call convenience and advice from a trained specialist who directs you to the resources that will serve you best during your time of need. 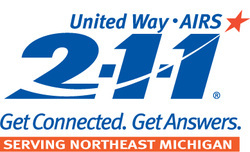 Please dial 1-888-636-4211 toll free to access 2-1-1 or visit www.211nemichigan.org to search the website. If you are an organization and would like to be added to the 2-1-1 database, please click here for instructions. Do you have a child between the ages of 11 and 14 years old that would like to become a Red Cross certified babysitter? Scheurer Hospital is offering a Babysitter training class on November 15, 8:00-3:00 in the Wilson Educational Center at Scheurer Hospital. To register go to www.scheurer.org. Huron Medical Center will be offering this class again in 2015, check back for more information. What do high quality early childhood programs provide? Experiences that prepare children for school success. Opportunities to develop self confidence and independence. Experiences that develop social and communication skills. Literacy activities that prepare children for learning to read. Math and science experiences to develop critical thinking skills. Our vision is all children healthy, safe, and ready to succeed in school and in life! The Huron County Great Start Collaborative (GSC) is a partnership of parents, community leaders and other concerned citizens who work together to ensure that every child in Huron County reaches her or his potential and enters Kindergarten safe, healthy, prepared for learning, and eager to succeed in school and in life. In 2009, the GSC conducted a county-wide assessment of early childhood services and supports and completed a strategic planning process. Through this work, the Huron County GSC Action Agenda was developed which in turn became the guiding document of the great start work in Huron County. The GSC is committed to on-going data, assets and needs analysis and revising their work plan based on findings. This group believes that by working together they can increase coordination, accountability, service delivery, and quality amongst programs, reduce duplication, and make the most of every dollar spent in early childhood. Why is investing in early childhood so important? In 2009, the GSC conducted a county-wide assessment of early childhood services and supports and completed a strategic planning process. Through this work, the Huron County GSC Action Agenda was developed which in turn became the guiding document of the great start work in Huron County. The GSC is committed to on-going data, assets and needs analysis and revising their work plan based on findings. This group believes that by working together they can increase coordination, accountability, service delivery, and quality amongst programs, reduce duplication, and make the most of every dollar spent in early childhood.